The Royal Theater offer, between days 30 November and 30 from December, 18 functions of a new production Turandot, from Giacomo Puccini, in co-production with Canadian Opera Company, he National Theater of Lithuania and the Houston Grand Opera, which opens in Madrid before joining the other theaters. Turandot, which he was presented at the First season the Teatro Real reinaugurado ─con musical direction of Wladimir Jurowski and scenic Jeremy Sutcliffe; y con Jane Eagle, Vladimir Galouzine and Veronica Villaroel in principales─ papers, returns, 20 years later, with stage direction, scenery and lighting Bob Wilson, whose very personal theatrical universe gives opera a sound universe adjusted spectral aura of the score, evoking an ancient world of oriental reminiscences, far from realistic approximation of the previous operas Puccini: Manon Lescaut, Bohemian, Tosca, Madama Butterfly, La Fanciulla del West, The swallow, The triptych, etc. Charismatic visual and dramaturgical language Wilson, backlit silhouettes, masks and almost ritual movements, It is the ideal place to tell the legend of Princess bloodroot China, Framed in its theatrical space 'natural', which connects directly with the millenary Shadow Theather oriental. The characters thus become legendary and hieratic archetypes, light and subtle palette Wilson is recreated with Puccini's orchestral colors and poetic synesthesia ranging from the icy tones of ruthless protagonist warm tones of the gathering of Liù, whose death, in the score, coincides with the composer himself, leaving the unfinished work. Giacomo Puccini He died in Brussels 1924, when it subjected to a treatment of throat cancer suffering. It was then at a crossroads to complete the third act of Turandot, with a surprising happy ending in which love triumphs over the perfidy. his disciple, Franco Alfano, He was commissioned to complete the score based on the sketches and notes left by his teacher and under the watchful supervision Arturo Toscanini, who led the posthumous premiere of the opera at La Scala in Milan, in 1926, in a famous representation in which the Italian director abruptly cut --after interpretation of slowly Toning choir after the death of Liù─ and addressed the audience saying: ‘Which he finished Maestro’ (Here ended the teacher). In successive functions it has been used the end of Alfano, which it is which is normally used since, although Luciano Berio He wrote another version released 2002 in Salzburg. In Turandot Giacomo Puccini takes a huge leap forward in his compositional writing: It moves away from realism and its great Manichaeism of emotions and explores a new dramaturgical universe with his eximia apertrechado art of orchestrating, his eclecticism and his portentous theatrical flair. Epigrammatic opera intertwines with an impressive dramaturgical reasons effectiveness, giving the chorus an unknown dramatic importance in previous operas. Explore universes bold harmonic and dissonant bitonal passages articulated with its proverbial melodismo, opening a flourishing road truncated by his sudden death. Two distributions alternate in the interpretation of the 18 functions Turandot, they bring to Real, once again, a Nicola Luisotti, associate musical director, whose relationship with the theater began ago 10 years The Troubadour, and we have seen in recent seasons Rigoletto Y Aida. After his triumphs with Verdi, Luisotti will again be put in front of Headlines Choir and Orchestra of the Teatro Real ─ and also the Little Singers of ORCAM─ to give life to the great score of Puccini. Leading the casts of Turandot two sopranos debuting at the Royal Theater: Swedish Irene Theorin and Ukrainian Oksana Diving, both acclaimed interpreters of the title role of the opera. They will be seconded by the Spanish sopranos Yolanda Auyanet Y Miren Urbieta-Vega, Liu como; tenors Gregory customer, Roberto Aronica Y Jae-Hyoeung Kim ─ which will alternate in the role of Calaf─, and low Andrea Mastroni Y Giorgi Kirof, who played Timur. Turandot dismisses the rich Italian operatic tradition, as phoenix, open new directions in the future of music dramaturgical, who took his first steps into the vast world of cinema, today, so close to the opera. 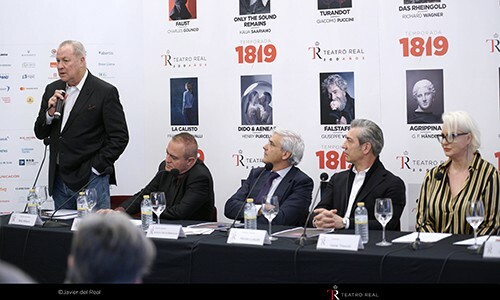 approaches: meeting with Nicola Luisotti, associate musical director of the Royal Theater and Turandot, Bob Wilson, stage-manager, set and costume designer Opera, and Joan Matabosch, artistic director of the Teatro Real. Chamber Sundays: concert with works by Wolfgang Amadeus Mozart, Francis Poulenc, Leos Janacek, Russell Peck, Luis Fonseca and Consuelo Díez. Everyone to the Gayarre! The secret name: The tenor will not let us sleep guess the three riddles inspired by the opera Turandot. Opera theater: projection Bohemian, Giacomo de Pucinni, Royal Theater production in co-production with the Royal Opera House in London and the Lyric Opera of Chicago, with musical direction of Paolo Carignani and staging of Richard Jones, Anita Hartig and Stephen Costello in the lead roles. Turandot and other secret names: storytelling show for adults, by Hector Urién, based on some of the most celebrated stories of Persian and Arabic storytelling tradition. literary visit: literary evening dedicated to love, touring various rooms of the museum.